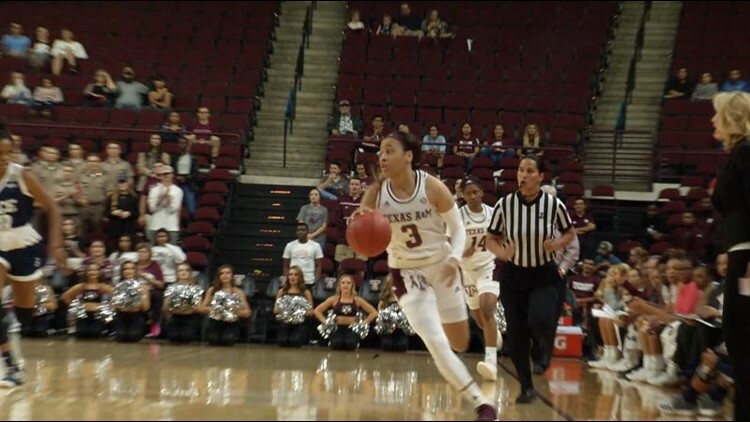 The A&M women's team re-enters the Top 25 for the first time in 2019. NEW YORK — Utah earned its first appearance in The Associated Press women's basketball poll in a decade entering at No. 21 on Monday. The Utes (16-1) last were ranked in the final poll of the 2008 season. They were one of four teams to enter the Top 25 after 13 ranked teams lost last week. Utah was joined by Florida State at 22, Texas A&M at 24 and Missouri at 25. While there was change at the bottom of the poll, the top eight teams stayed virtually the same with Notre Dame leading the way. The Fighting Irish received 22 first place votes from the 30-member national media panel. Baylor broke a tie with UConn for second, garnering seven top ballots. The Huskies got the other one and dropped to third. Louisville and Oregon rounded out the first five teams in the poll. YOUNG UTES: Utah is off to its best start since 1997 when the team won its first 16 games. With four freshmen on the roster getting significant time the future remains bright for the Utes, who head into a difficult part of their schedule with home games this weekend against Cal and Stanford before heading up to face Oregon and Oregon State next weekend. The one loss came against No. 16 Arizona State. Utah had a 6-point lead with 1:20 to go in that game before falling at the buzzer. The team also lost it starting point guard to an ACL injury. Coach Lynne Roberts wasn't sure how her squad would respond 36 hours later when facing Arizona and the team responded with a rout of Arizona. RISING RUTGERS: The 14th-ranked Scarlet Knights remained unbeaten in the Big Ten with a win over then-No. 17 Michigan State on Sunday. Rutgers moved up six spots this week in the poll and has its best ranking since it was 13th on Jan. 30, 2012. The Scarlet Knights have won 10 consecutive games overall. BIG EAST PRIDE: Marquette reaching 10th is the highest a team has been ranked in the Big East since the conference split up a few years back. The last time a current member of the Big East was in the top 10 was the preseason poll of 2011 when Georgetown was 10th. Others receiving votes: BYU 32, Tennessee 23, Minnesota 21, Drake 20, UCF 20, South Dakota 11, Clemson 11, California 9, DePaul 8, Miami 6, Boise St. 3, Indiana 1.